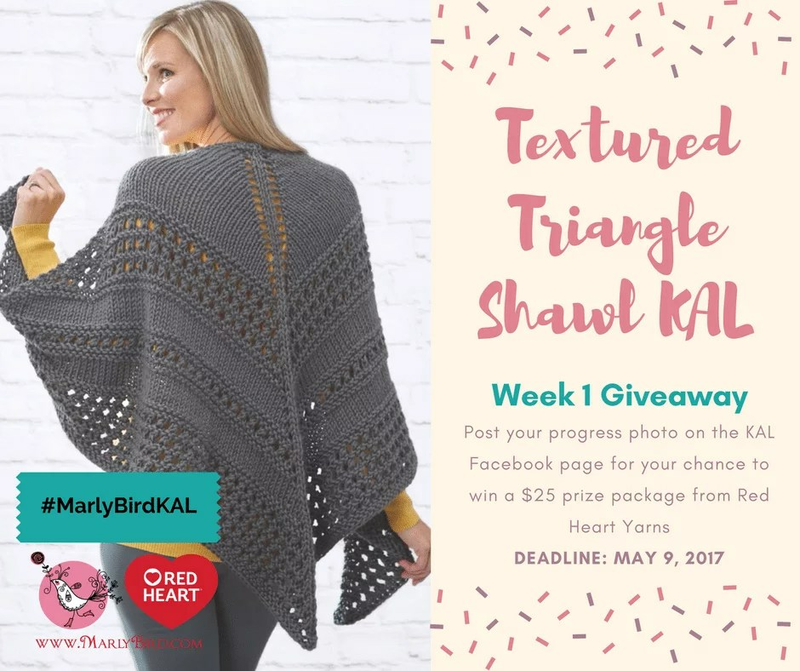 The Marly Bird Textured Triangle Shawl Knit-along Section 1 is sponsored by Red Heart. This is the second KAL I am hosting on my blog with Red Heart and includes a full set of HD videos of me demonstrating how to do each step of the shawl! You will find the full instructions for SECTION 1 below. Queue it up and like the pattern on Raverly. The spring 2017 Textured Triangle Shawl KAL is the perfect project to teach you some basic lace in knitting. Made in a bulky weight yarn it will be easier to see you stitches. I will walk you through every step of the pattern and be here to answer you questions. Join us in the Facebook KAL group to know when the new videos go live and to join in with the chatter. Wear this oversized knit shawl bunched up; like a scarf, or wrapped around your shoulders, either way you’ll stand out in the crowd. There are quite a few repeats in this pattern. In order to keep track of where you are in the pattern I have written out each link of the pattern for you so that you can mark them off as you go. You can also download the FREE PDF pattern from Red Heart along with my additional charts. The official start date is May 3, 2017. There will be one video released each week along with the pattern instructions for that section. You will find a full schedule at the end of this post with links as they are available. There is a dedicated Facebook group for this KAL that is monitored by me and several of the WONDERFUL sampler knitters that work with me. We are all there to help you with this project. Please join us! Below you will find the instructions for SECTION 1 of the Textured Triangle Shawl. THE GAUGE: 10 sts = 4″ [10 cm]; 16 rows = 4″ [10 cm] in Stockinette stitch. FINISHED MEASUREMENT: Shawl measures 70″ [178 cm] at widest top edge and 30″ [76 cm] at longest point at center back. Starting the pattern off we will learn how to make a garter tab beginning. This is a great start for this project because the garter stitch is used to frame the entire pattern. Through this section you will also learn about kfb (knit into front and back) as well as yarn overs. Together these two things make a lace pattern down the spine of the shawl. Join me as we start this project. First and foremost…both are correct. The shawl will work the same either way it is written or how I showed you in the video. RE Row 2: I just moved the K1 after the YO to match the other side of the shawl since I repeatedly mentioned that one side of the shawl is a mirror of the other. Yes, as it was pointed out, when you do a kfb, you get a little purl bump after the knit stitch. At the beginning of the row, you do a kfb on the second stitch, making the purl bump the third stitch of that row. To get a “perfect” mirror image on the other side, you’d have to do the kfb before you knit the last two stitches. vv,v————–,vv. I wasn’t concerned about the Purl Bump. I wanted the knitter to think more along the lines of… [Kfb, K1, Yo] PM, K2, PM, [Yo, K1, Kfb]… Teaching wise, it is easier for a new knitter to see this direct reflection. RE the beginning and end stitches; my thought process was the same. Again, I wasn’t concerned about the purl bump. AND, I didn’t point this out on camera (hindsight is 20/20 and maybe I should have but I didn’t on purpose…I will make a note of it in the second video) because I didn’t want to muddy any instructions I had made regarding each side is a mirror image so what you do on one side has to be done on the other side in reverse. Do you see what I mean? Whether you follow the pattern as I’ve established it in the video or as it is in the written instructions…both are correct. 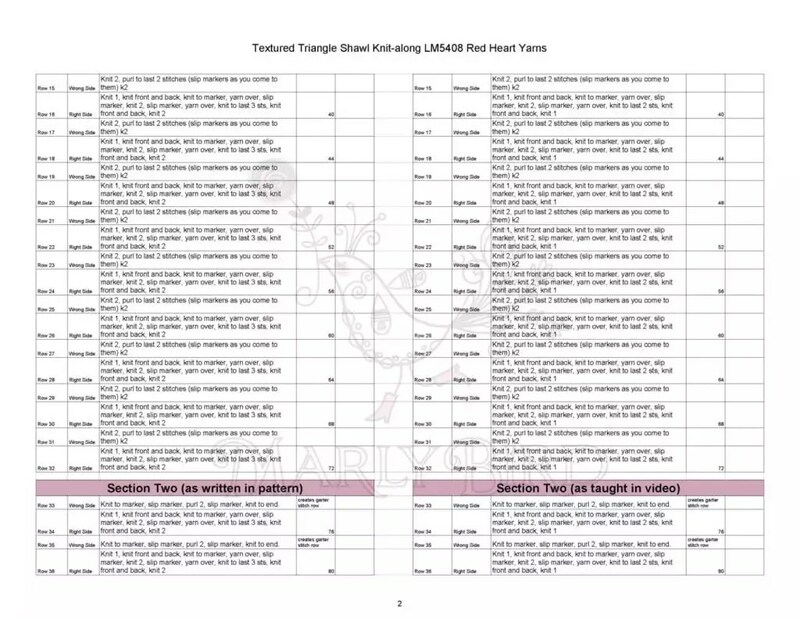 I also updated the Line-by-Line instructions to include a spreadsheet for the pattern as written AND the pattern as I taught it in the video. Choose which one you want to follow and stick with it. I explained this more in a special Q & A video that can be found here. You will notice that these instructions look slightly different than what I showed you in the video. Well, you will notice that the table on the LEFT is actually the same. 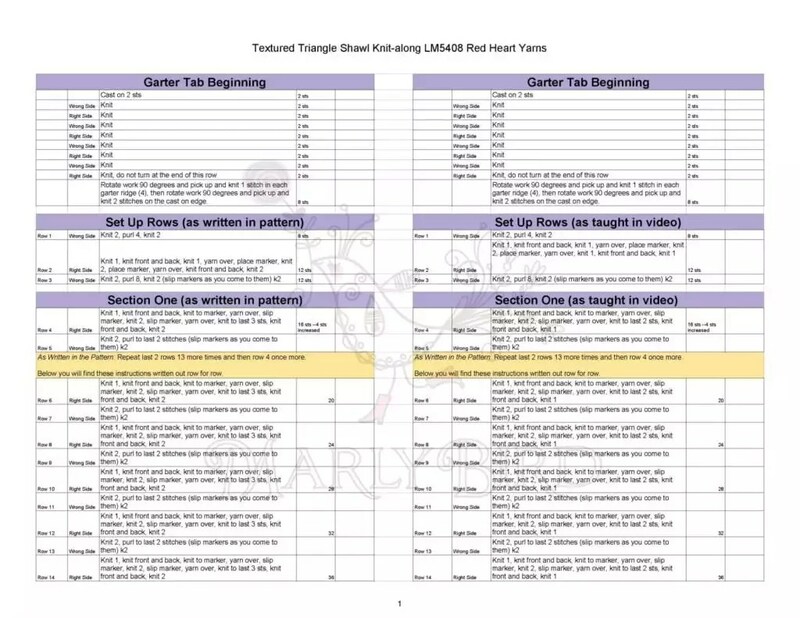 BUT, because I made a slight change to the way the pattern is written when I did the video, I decided to do an extra spreadsheet with those actual written instructions. Both instructions will get you the same shawl! It’s just my experience that beginners learn better the way I taught the pattern in the video so I tweaked it. Go ahead and choose which pattern you want to follow along with and stick with it. Finish section 1 and be ready to start section two on May 10, 2017. Once you finish your section be sure to post pictures to the facebook group as there will be a $25 prize package given away from RedHeart.com to one lucky person (who is randomly chosen) that has finished his or her homework during the week of May 3, 2017 – May 9, 2017 @ 11:59pm. Good luck! View all of the videos in the call on my YouTube Channel. A new video will be posted each week. You will pick up the one next to the tip. You can watch the YouTube video in the post to see exactly how I do it. The garter ridge is right in the beginning of the video. That garter ridge tab, was much easier than it looks! I’m not gonna lie, it had me a bit. Anxious! You made it so easy to follow! I did it, without my mom’s help! I can hardly wait to show her! This is my first shawl. I do not see the line by line directions for session 2. I am late starting and just watched video 1. Do you have a video for left handers? It would make it easier for us as I had difficulty following what you you actually doing sometimes. Also, you keep saying knit 2 together, but I don’t see in the pattern where there is knit 2 together. Am I missing something?